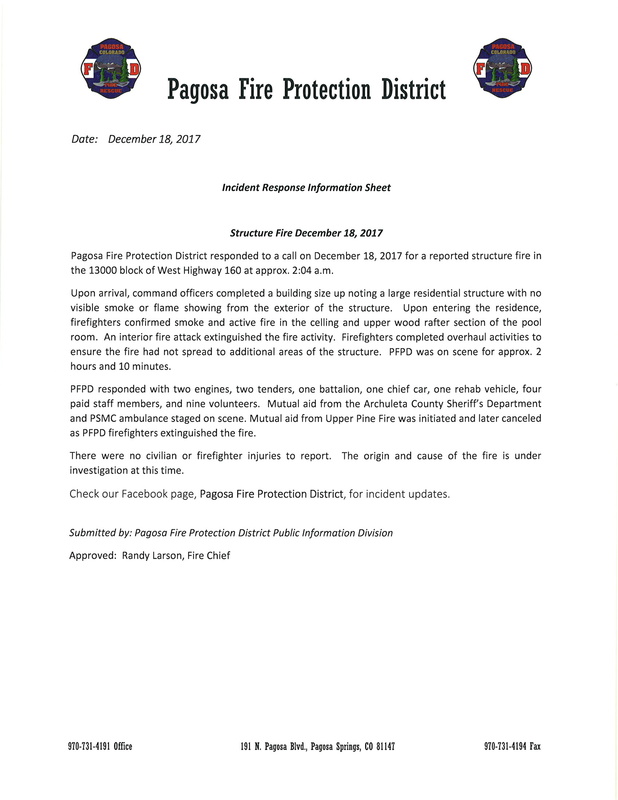 Pagosa Fire Protection District responded to a call on December 18, 2017 for a reported structure fire in the 13000 block of West Highway 160 at approx. 2:04 a.m. Upon arrival, command officers completed a building size up noting a large residential structure with no visible smoke or flame showing from the exterior of the structure. Upon entering the residence, firefighters confirmed smoke and active fire in the celling and upper wood rafter section of the pool room. An interior fire attack extinguished the fire activity. Firefighters completed overhaul activities to ensure the fire had not spread to additional areas of the structure. PFPD was on scene for approx. 2 hours and 10 minutes. PFPD responded with two engines, two tenders, one battalion, one chief car, one rehab vehicle, four paid staff members, and nine volunteers. Mutual aid from the Archuleta County Sheriff’s Department and PSMC ambulance staged on scene. Mutual aid from Upper Pine Fire was initiated and later canceled as PFPD firefighters extinguished the fire. There were no civilian or firefighter injuries to report. The origin and cause of the fire is under investigation at this time. Check our Facebook page, Pagosa Fire Protection District, for incident updates.